The fourth National Climate Assessment, released on Black Friday (November 23rd) 2018, highlights many of the dire effects of climate change that are already being experienced in the United States, and it warns that unless great steps are taken now to slow the progression, these effects will continue to intensify. The Trump administration, which appears relatively apathetic toward climate change issues, was required by law to release this report due to a Presidential Initiative signed into law by George H.W. Bush's administration in 1989. Activists in Washtenaw County, in particular the Ann Arbor chapter of the Citizen’s Climate Lobby, have for years called upon local governments to adopt policies direct the federal government to put a price on carbon through a “carbon fee and dividend” system, as measure for slowing the impacts of climate change. In 2017, Ann Arbor adopt a resolution of support for “carbon fee and dividend” as a part of their Climate Action Plan. Kris Olsson, a spokesperson for the Ann Arbor CCL, will offer insight into some of the potential for climate change related problems in our county and what locals can do to fight them. 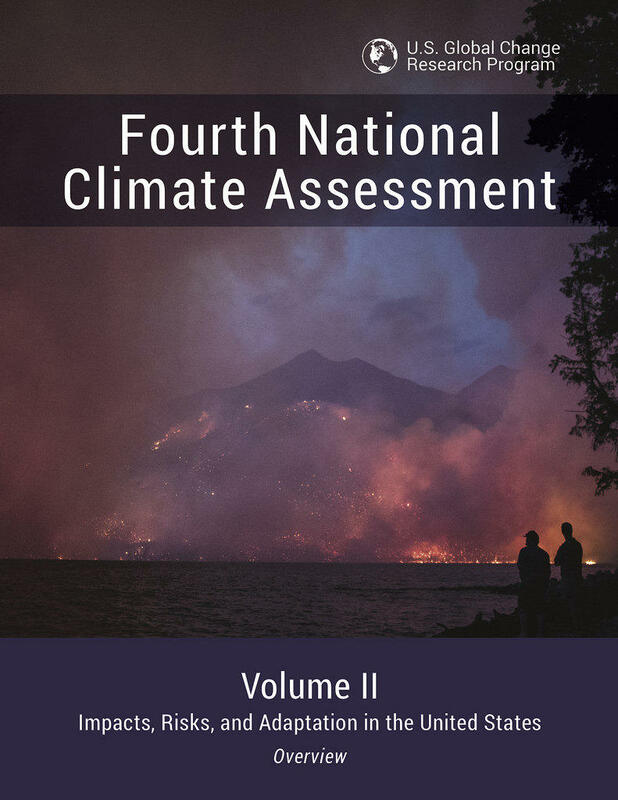 Volume II of the Fourth National Climate Assessment (NCA4), released [in November 2018] by the United States Global Change Research Program (USGCRP), focuses on climate change impacts, risks and adaptations occurring in the U.S. The report contains supporting evidence from 16 national-level topic chapters (e.g., water, oceans, energy, and human health), 10 regional chapters and two chapters that focus on societal responses to climate change. USGCRP also released the Second State of the Carbon Cycle Report (SOCCR2). The 1,600-page report details the climate and economic impacts U.S. residents will see if drastic action is not taken to address climate change. "The impacts of global climate change are already being felt in the United States and are projected to intensify in the future," the researchers say. Report co-author Katharine Hayhoe of Texas Tech University said it shows the dangerous weather that scientists said will happen in the United States is already happening. This is the fourth National Climate Assessment. It was mandated by Congress in the late 1980s and is prepared every four years by the nation's top scientists from 13 agencies. It's meant as a reference for the president, Congress and the public. What makes the report different from previous versions is that it focuses on the United States, then goes more local and granular. The report frequently contradicts President Donald Trump, who took to Twitter on Wednesday night to again express his doubts about climate change, using the especially cold Thanksgiving forecast as an example. "Brutal and Extended Cold Blast could shatter ALL RECORDS - Whatever happened to Global Warming?" the president tweeted. But weather isn't climate, the researchers say. They say cold snaps can occur even as the planet warms overall. “Over shorter timescales and smaller geographic regions, the influence of natural variability can be larger than the influence of human activity," they write. "Over climate timescales of multiple decades, however, global temperature continues to steadily increase.” Environmental groups quickly reacted to the report. Report co-author Brenda Ekwurzel of the Union of Concerned Scientists said it "makes it clear that climate change is not some problem in the distant future. It’s happening right now in every part of the country. “U.S. residents are now being forced to cope with dangerously high temperatures, rising seas, deadly wildfires, torrential rainfalls and devastating hurricanes," she said. "The report concludes that these climate-related impacts will only get worse and their costs will mount dramatically if carbon emissions continue unabated." Nathaniel Keohane of the Environmental Defense Fund said “it is worth nothing that the report was released by an administration that has persistently ignored the warnings of scientists, economists, businesses and community leaders that corroborate the report’s findings. ”As long as government leaders sit on their hands, Americans will suffer for generations to come. The evidence is clear: the Trump administration is failing to protect the American people." By the way, I should mention that the U.S. Global Change Research Program (USGCRP) had actually been proposed in President Reagan’s final budget. Senator Earnest Hollings made the following statement once the Global Change Research Act received 100-to-0 passage in the Senate: the problem we face is potentially enormous. Global warming could radically change world climate and world agriculture…We need a determined and coordinated research effort, both here in the United States and with other nations, to get the facts about the exact causes and consequences of global change. For our children and grandchildren, now is the time to start that effort. To date, there have been four National Climate Assessments (2000, 2009, 2014, and 2017/2018). Of particular interest, the report release on Black Friday (or #ClimateFriday) was very explicit in how climate change is already affecting the United States. It was also very forward on the impacts to the national economy and American lives. I often complain of "report fatigue" because they often are just pages and pages of graphs and scientific jargon with a focus on "what may happen." However, I do think this report, particularly the online material, is very accessible to the layperson and does an excellent job conveying the "here and now" impacts on the U.S. and your kitchen table issues. Ann Arbor is calling on federal lawmakers to put a price on carbon to help reduce pollution and fight climate change. Once again calling climate change a serious threat and reiterating the city's commitment to reducing its carbon footprint, the City Council voted 9-0 this week to voice support for a national carbon fee and dividend program as advocated by the Citizens' Climate Lobby." A carbon fee aims to account for the societal cost of carbon pollution," states the resolution brought forward by Council Members Jason Frenzel, D-1st Ward, and Chip Smith, D-5th Ward, at the recommendation of the city's Energy Commission. The city is now officially supporting the CCL's proposal calling for imposing a carbon fee on all fossil fuels and other greenhouse gases at the point where they first enter the economy. The fees would be collected by the Treasury Department and rebated to American households in the form of dividend payments. In 20 years, such a system could reduce carbon emissions to half of 1990 levels while adding 2.8 million jobs to the American economy, according to the CCL, a California-based nonprofit group advocating for national policies to address climate change. The CCL argues it would stimulate investment in alternative energy and give businesses powerful incentives to increase energy efficiency and reduce their carbon footprints to stay competitive. Fossil fuel consumption accounts for a majority of greenhouse gas emissions in the United States, and climate scientists and economists assert a carbon price is one of the most effective and realistic potential methods for reducing emissions, council members stated, expressing some optimism about bipartisan support for the plan. Proponents say the dividend component makes the plan revenue neutral, and a carbon fee that is directly rebated in equal shares would provide a net financial benefit to a majority of households with the greatest benefit going to people with lower incomes. "The reason for this is that lower-income households have a smaller carbon footprint than average. They buy less stuff, live in smaller houses, don't travel as much," said Ginny Rogers of the Ann Arbor chapter of the CCL. "And thus their equal share of the dividend more than covers their additional expenses." According to the CCL, it would place a predictable, steadily rising price on carbon, with all fees collected minus administrative costs returned to households as a monthly energy dividend. "This dividend helps citizens pay the increased costs associated with the carbon fee while our nation transitions to a clean energy economy," the CCL states in its proposal. "Because not everyone uses the same amount of carbon, the majority of American households (about 66 percent) are estimated to earn back as much or more than they pay in increased costs. Rogers, who advocated for passage of the council resolution, said Ann Arbor has an ambitious Climate Action Plan but it still has a long way to go to achieve its emission-reduction goals. "A national carbon price would greatly incentivize the transition to clean energy and would help us reach our targets," she said. "The city has struggled to find the funding to implement many of the steps in our Climate Action Plan, but under a carbon fee and dividend policy many of the actions would occur naturally." The city clerk is sending copies of the council's resolution to the CCL, the Climate Leadership Council, U.S. Senators Debbie Stabenow and Gary Peters, and U.S. Rep. Debbie Dingell. The City Council also is asking the city administrator to devise a strategy to effectively advocate for the plan. "There are over 50 other municipalities that support a fee and dividend-type structure," Frenzel noted at the council's meeting Monday night, Aug. 21. "Obviously a lot of them come from California, but a few to highlight: Philadelphia, San Francisco, Portland, Oakland, Pittsburgh -- the state of California also, of course." Kris specializes in GIS analysis, landscape ecology, and code and ordinance development. Kris earned two Masters of Science (resource ecology, natural resource policy) degrees at the University of Michigan. She joined HRWC in 1992.